It is an overcast, dark and dreary Saturday afternoon here with occasional sprinkles coming down, although it looks like the sky could open up at any moment. It's a great day to play around in the kitchen. This afternoon I decided to experiment a bit. I wanted to see if an "almond flour coated" onion ring would work. 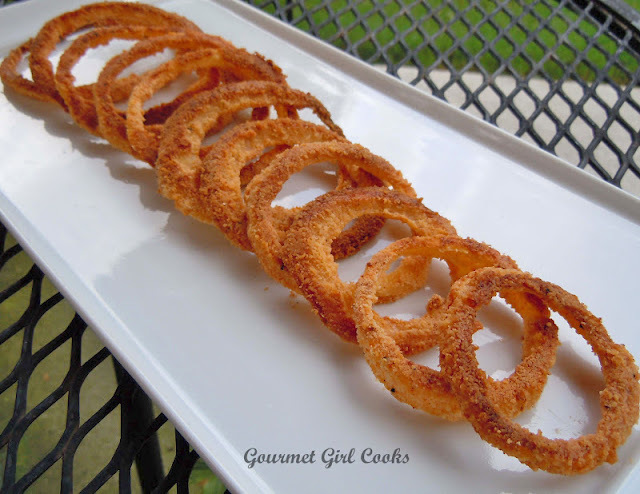 So I did a "test batch", making only 1 dozen onions rings. That way, if it wasn't any good at all...I wouldn't be throwing away a lot of ingredients as well as wasting a lot of my time. 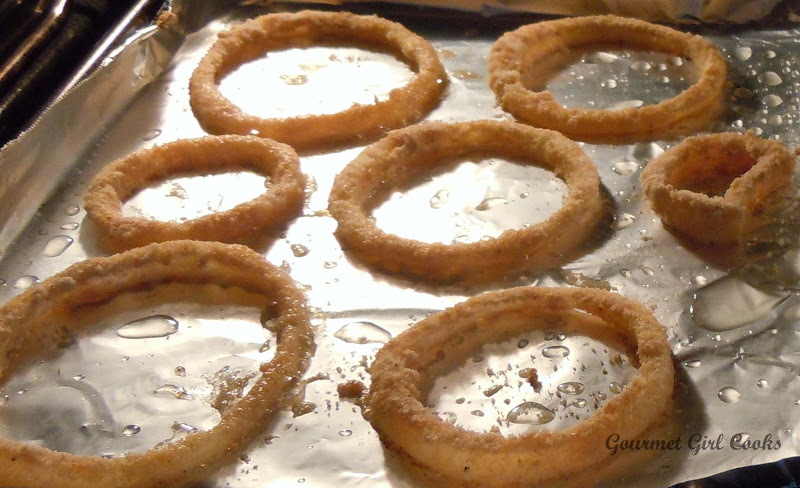 I know that onion rings are typically deep fried...but I don't particularly care with all the mess that goes with that...so I thought I'd see how they would turn out in the oven -- and of course I wanted them to be wheat/grain free. I started working on this because I am already thinking about some of my Thanksgiving recipes and wondering how I can revisit and revise some of them. I was thinking this afternoon about my green bean casserole and trying to find a better substitution for the "fried onion" topping from a can that goes on them. I'm also working on the "sauce" part too...but that will be another day's project. 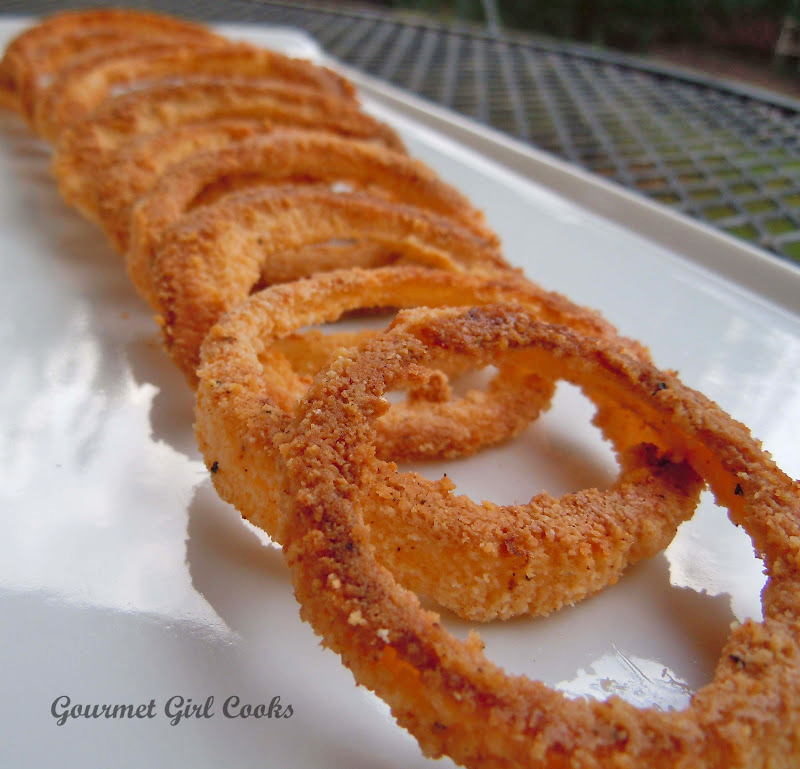 So, these onion rings turned out surprisingly good -- not super crunchy like deep fried ones would be, but light and crispy and delicious. Hubby, who is normally an onion ring snob, (unless they are from The Varsity) even liked them! Below are a few pics as well as my "test batch" recipe if you decide you might also want to try them on a smaller scale first -- that way if you like it, you could multiply the ingredients or you could decide how you might want to adjust them to your own taste (add extra seasonings, etc.). Enjoy! Preheat oven to 400 degrees. Line a baking sheet with foil (I used Reynold's non-stick foil) and brush lightly with about 1 tablespoon of olive oil (no need to use your good Extra Virgin olive oil; I used my light "non-virgin" olive oil for this). In a small bowl, beat egg and half and half together; season with salt and pepper to taste; add onion rings to the egg mixture, toss and let sit to soak while you make the coating/breading. Here they are baking away -- if you wanted them to be more "fried like", you could easily add more oil to the pan -- I only brushed about 1 tablespoon on. HELP! Can you post a "tutorial" for successful dredging such as these onion rings? A friend was dying for these and I want to make them too, they look picture perfect, but getting the breading to stay on without making a glompy mess in the dredging bowl is a challenge. His breading would not stay on his. A tutorial would be fabulous! Thanks! Hi Steph...sorry you had trouble with them. The key is to use a shallow bowl or dish for the "breading"...and make sure that you shake off any excess eggwash mixture. Lay the rings one at a time into the crumb mixture and using a teaspoon, spoon the crumbs over the top side, gently pressing into the breading...flip and make sure you gently press again -- you want to keep your bread crumbs as dry as possible (so you don't want a lot of excess eggwash dripping off in your crumbs making them clump up -- the coating should be light. Does that help you? Let me know. Thanks! P.S. -- If that doesn't work or help, I will make a small batch again and snap photos along the way to show you the steps. Finally got around to making these and they were outstanding. I was out of paprika so I used Zatarain's Creole Seasoning, which gave them a little 'kick'. So glad you liked them Shieldmaiden -- I bet the Zatarain's did give them some extra kick - I like things a little spicy. Again...glad you liked them...thanks! Looks good! What do you suggest subbing for the half and half if you are dairy free? I just made these for dinner and they are FANTASTIC! Love the "breading"...they have a great taste and texture. Great recipe. Thank you for sharing! I just made these, OH MY GOD! I used a vildalia onion, SO YUMMY! Hi there!! these look amazing- I am dairy free- so I was wondering if almond milk (plain) or unflavored/ unsweeted coconut milk would work..? Thanks! trying these out tonight!! if possible, does anyone know the nutrition specs for these! trying to keep track of my macros thank you in advance!